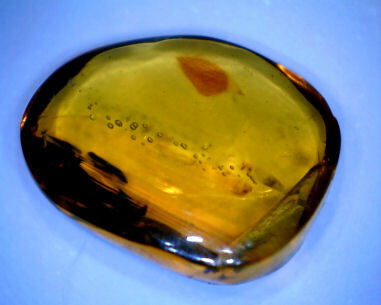 Amber is fossilised, hardened tree sap from pine-like trees that grew in ancient rainforests which once covered the earth, as much as 120 million years ago. As the sap oozed from the bark of prehistoric trees, plant life and any animal that couldn't escape its sticky clutches became trapped and encased in an often perfectly transparent tomb. Stunning detail of the leaves, flowers and insect life is perfectly preserved in these amber time-capsules, giving us the opportunity to gaze at a snapshot of an ancient ecosystem. Some gems contain a number of dfifferent insect species, predators, prey, and the plants on which they fed and pollinated. Amber is both beautiful and fascinating. If you are interested in paleoentymology & paleobotany or if you simply admire the beauty of this unique gem material then take a look at our specimens for sale where you will find photographs and photomicrographs of each individual gem. All of our amber is natural and other than having been polished, have not been treated or altered.